Ron and Sandra Lightburn have created two picture books together, Driftwood Cove and Pumpkin People. When they moved to the Annapolis Valley in 1997, the Pumpkin People of Kentville caught their imagination and they created a book about it. Sandra wrote these two books and Ron illustrated them. Sandra now makes really fun dolls! Ron illustrated his first children’s picture book, Waiting for the Whales, in 1991 and received three national awards including the Governor-General’s Literary Award for Children’s Illustration. He went on to illustrate many books, including Pumpkin People and his most recent, which he also wrote, FRANKENSTINK! Garbage Gone Bad. Also, here’s a link to Ron’s Flickr gallery of paintings that celebrate the beauty of Nova Scotia. 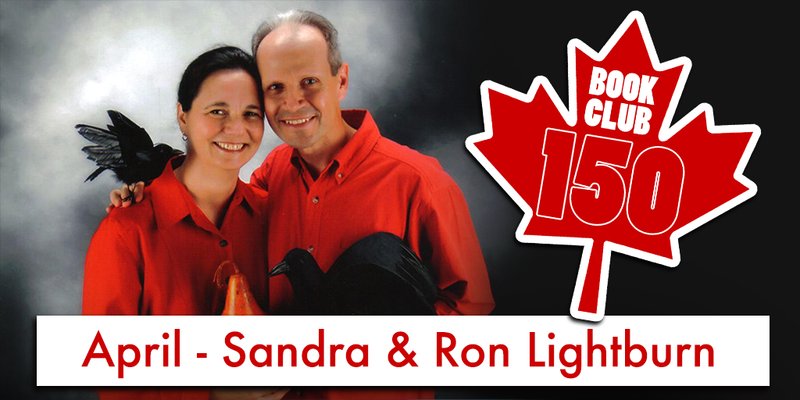 Ron & Sandra Lightburn have done many public events in our area, and you may have met them in a parade, a StoryMob, or at school. And if you haven’t yet met them, come to the Berwick Library on April 22! This month we celebrate two creative people who live right here in our own area. Draw us a picture of what you think Frankenstink, a monster made of garbage would look like. Share online with the hashtag #BookClub150, or fill out a ballot at your local library. You could win a GIANT SIZED FRANKENSTINK SWAG BAG, including your own copy of the book Frankenstink, a signed Frankenstink colouring book, a Sandra Lightburn original stuffed doll, a signed poster, bookmarks, and 20 cover flats from Ron Lightburn’s illustrated books (whew)! Click on a link below to visit www.valleylibrary.ca. Sign in with your AVRL library card, place a hold, and have a copy sent to the Valley Library of your choice. Watch this short video featuring one of the Annapolis Valley Regional Library’s Storywalks. This one is created using the picture book “Juba This, Juba That”, by Helaine Becker and illustrated by Ron Lightburn. What is Book Club 150? To celebrate Canada’s 150th birthday, we are highlighting a different Canadian author or illustrator for each month of 2017. To celebrate with us, we encourage you to read the books, join our online conversation, and enter our monthly contests. Our featured books include titles for kids, teens, and adult readers. Pick up a copy at your local library, look for a Book Club in a Bag to share, or find a library Book Club near you. We’ll have special events and contests throughout the year, so be sure to visit our library website at www.valleylibrary.ca, or look for feature posts each month on our new library blog site, RenewYourCuriosity.ca.